The Representative Church Body Library, Dublin, has an exhibition showcasing some of its collection of miniature and small books available on display in the Library. Two particular items are worth noting: one is a miniature Bible presented to the Library by CJ Lundy, son of the Revd St George Lundy (1914-1976), and the other a beautiful edition of the Book of Common Prayer (BCP), which was purchased from a local charity shop after the Library was notified of its existence by a member of the public. The RCB Library holds well in excess of 80,000 books, many of which have been donated by those associated with the Church of Ireland and other religious institutions, as well as by members of the public. These items in particular attest to their innately personal nature. The first item, donated by CJ Lundy, is an intricate, miniature version of the Holy Bible, containing the Old and New Testaments. Measuring only 4.3 cm in height and 3 cm in width, the Bible is bound in a dark blue cover. A particularly delightful aspect of the volume is that it includes drawings of notable biblical events. This miniature book was a product of David Bryce & Sons, a publishing house noted as masters of miniaturisation, using the latest technological advances in photolithography and electroplating to produce ever-smaller versions of popular texts. It comes complete with a magnifying glass to help the reader with deciphering the text, such aids being a particular feature of these kinds of books produced by Bryce. On the front endpapers of the book, the inscription that states: ‘From the Library of John Knott, M.D. given to St George Lundy by Eleanor Knott with best wishes 23 IV 1938’. 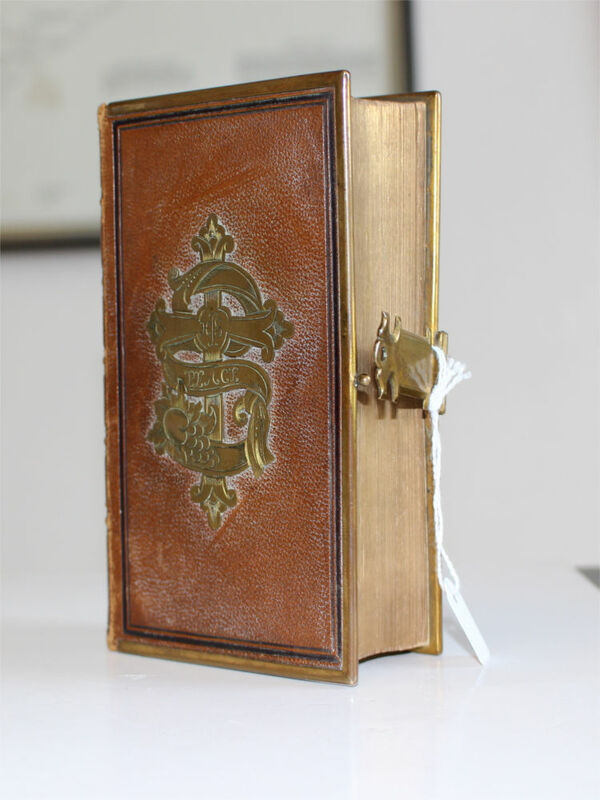 Eleanor Draper’s Book of Common Prayer, complete with distinctive frontal brass piece, clasp, and gold-edged papers. © Representative Church Body, Library. St George Charles Hubert Lundy was baptised in St Mary’s Church in Donnybrook parish on 20th May 1914, with the family residing in 4 Churchill Terrace. After moving to 11 Strand Road in Sandymount, the family became members of St Michael’s parish in Irishtown. He trained in Trinity College with the aim of becoming ordained in the Church of Ireland, eventually becoming curate in Christ Church in Lisburn and St Mary’s in Belfast. In 1938, he received his Divinity Testimonium from Trinity College Dublin (TCD) and so began his deaconship, but given that it was St George’s birthday on 24 April, it might be assumed that this book was a gift to mark this anniversary. It was given to Lundy by the remarkable linguist Eleanor Knott (born 18th November 1886). The Knott family resided in Dublin in 34 York Street, near St Stephen’s Green and the miniature Bible came from the library of John Freeman Knott, a medical doctor and Eleanor’s father. Eleanor was encouraged by her Cornish mother, Philippa Annie Knott (née Balcombe), to study Irish, and came to focus on Old Irish at the School of Irish Learning in 1907. She began working for the Royal Irish Academy in 1911 and eventually became a lecturer in Celtic Languages in TCD in 1928. A year after presenting St George with the miniature Bible, a Chair of Early Irish was created for her in TCD. Her gift to Lundy was both a deeply personal and an innately respectful gesture. We can only speculate as to whether the two initiated their friendship on the campus of the university, but it is without doubt that their friendship had already begun during this important time for both. The RCB Library was alerted to the existence of the second featured volume by a member of the public who saw it for sale in a local charity shop. It has a small budget for purchasing materials of direct relevance to the Church, and on inspection of the item in question, purchased it for longevity. This edition of the BCP, published in 1861 by G. E. Eyre and W. Spottiswoode, is in remarkably good condition, being a near-perfect copy, with a simple ‘Church Service’ in gold on the segmented spine. The book is bound in brown leather and the pages are gold-edged. What really takes the eye is the metal clasp that protects it, as well as the gold brass symbol on the front which states ‘peace’. 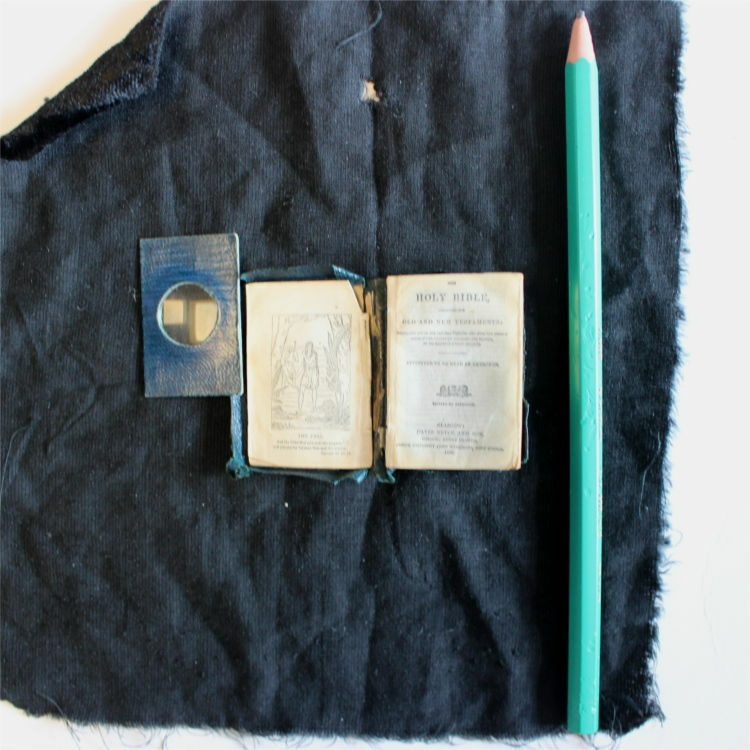 Eleanor Knott’s miniature Bible, complete with magnifying glass and a pencil for scale. © Representative Church Body, Library. In contrast to Knott’s miniature Bible, biographical information on the provenance of the BCP indicates it may have been a treasured keepsake. On the front endpaper are two inscriptions, in different hand and ink. The first reads simply ‘M Draper. 1863’ while underneath is the inscription ‘Given to Eleanor Draper by Aunt Helen Montague March 20 1908’. These tantalising bits of information led staff on a quest to find more information about the elusive Eleanor Draper, using online genealogical sources such as the 1901 and 1911 census forms. From this research one can argue with a degree of confidence that Eleanor Draper was born in Dublin on 3rd January 1867. Her parents, Carter and Sophy, were married in Rathmines Chapel of Ease in 1866 and had moved to Blackrock by the time of Eleanor’s birth. Eleanor’s father was an architect from Wicklow, whose notable work was the Halpin Memorial, in Fitzwilliam Square in Wicklow town. The civil record of Eleanor’s death on 6th December 1962 states that she was a teacher. Items such as this often contain dedications, notes, or personal items to underline their importance. In addition to the dedication, an original photograph of the British Legation at Kabul was inserted into the middle section. There is no indication of the reason that Eleanor placed this image in the book. On the back, in pencil, it simply states: ‘British Legation Kabul’. It would be fascinating to know if, for example, her father had worked on the construction of this building. These rare items are just two examples of the many unique items that the RCB Library holds and the stories they help to uncover. Visitors are invited to view both volumes in the context of a selection of other miniature and small books in the RCB Library hall. The online exhibition, available through this link (www.ireland.anglican.org/about/rcb-library/archive-of-the-month) was researched and compiled by Jennifer Murphy, Library Assistant, and Bryan Whelan, Assistant Librarian.